If you have ISO image and want to rip and copy ISO images on your Mac or Windows computer, MKV is probably what you are looking for. Before learning how to convert ISO file to MKV on Mac/PC, let's talk about MKV and reasons to convert ISO to MKV first. 1. MKV is open source, making it freely available to developers, thus offering an arguably higher potential for more creative solutions & broader implementation. 2. Converting ISO image to MKV makes you enjoy advanced cinematic extras such as multiple audio tracks (e.g. director's commentary), subtitles, chapter points, bonus content and more as it is like a DVD navigator. 3. MKV is the utmost output format to preserve high video quality. 4. 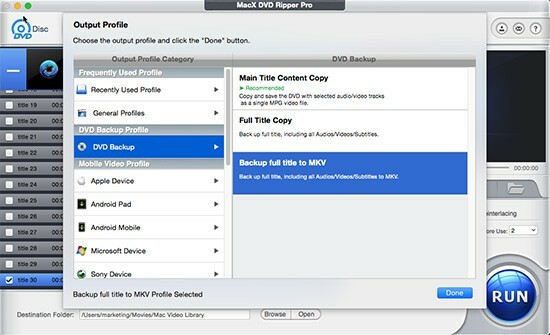 After ripping ISO to MKV you can backup and store the digital copy on hard drive or online store system, even use your QuickTime player or Windows Media Player to play MKV on Mac or Windows. To rip ISO image to MKV on Mac OS X and Windows, you need nothing but an appropriate ISO image to MKV converter. MacX DVD Ripper Pro is highly recommended among users for its simplicity, fast ripping speed and high video quality while ripping ISO image and DVD to MKV, as well as other video formats, including MP4, MOV, AVI, WMV, FLV, etc. Beside ripping ISO file to MKV format on Mac and PC, this ISO to MKV converter software constantly upgrades to decrypt and rip copy protected DVD, no matter the new Disney DVD Copy Protection or general CSS encrypted DVDs. Therefore, you can even enjoy the new DVD releases on the go. 1. Decrypting Ability : The DVD to MKV ripper is built in a unique DVD analysis tech and title check mechanism, enabling to rip protected DVDs by bypassing CSS, Region code, UOP, Sony ARccOS, Disney X-project protection, etc and automatically choose the right title among the multiple fake ones. Always the first one to support the new DVD releases and the only one to conquer all intractable DVDs, be it 99-title DVDs, workout DVDs, av DVDs, damaged DVDs and even the DVDs unplayable. 2. Fast speed and high quality: Uniquely, by harnessing hardware encoder, multi-core CPU and hyper-threading tech, the software greatly accelerates the DVD ripping speed. Specifically, the fast DVD ripping process is shortened within 5 minutes at up to 300fps with CPU usage less than 150%. Besides, high-quality engine and deinterlacing help to output MKV with the highest possible quality. 3. Edit Movie: It's available for you to not only rip DVD to ISO image but also crop out unwanted parts, black bars, enable/disable subtitles and even add subtitles to make you better understanding your movie. Just rip ISO to MKV with all videos/audios/subtitle tracks. 4. To Any Format/Device: Besides ISO image to MKV conversion, the tool also supports rip DVD/ISO image/Video_TS folder to MKV, MP4, WMV, MOV, AVI, etc and convert DVD to any portable devices, game consoles, TVs, etc. Free download ISO to MKV ripper on your computer or Mac version and run it, click "DVD ISO" to import it on your computer. Select the output format as you want. In this guide, if you want to rip DVD .iso file to MKV, go to DVD Backup, Backup full title to MKV. This will keep all your videos, audios and subtitles. What's more, this DVD ripper for Mac supports to rip DVD/ISO image/Video_TS Folder to MP4, AVI, MOV, WMV, FLV, etc and convert DVD/ISO image to iPhone (7/6S), iPad Mini 4/Pro, Apple TV (4), etc. Specify output folder on your computer to save the output files. Click "Browse" to choose the path where you want to save the output file in. Click the "RUN" button to start ripping and compressing ISO to MKV on Mac or Windows. You can view the backup progress and are able to cancel it at anytime. After you have ripped your source ISO data to MKV, you get easier to watch DVD movies with VLC, Quicktime player etc on Mac. And do you know you are even allowed to watch the DVD movies on iPhone iPad devices within an extra step? MacX MediaTrans, an excellent iOS video transfer can make you do so by transferring MKV videos from Mac to iPhone iPad iPod without spare conversion. Q: Why won't turn ISO image to MKV using MakeMKV? A: MakeMKV is known for making digital backups of DVDs for enjoying freely and quickly. It is still in beta version, which means you can free switch ISO/DVD to MKV without paying anything. But MakeMKV doesn't work well on the latest Mac and Windows version and won't support newly released DVDs, or iSO images. For example, users in MakeMKV forum indicate that the free iSO to MKV converter won't choose the correct playlist, has no subtitles or gets black frames throughout the whole movie after the conversion, corrupt or invalid source file, OS/Scsi error, etc. So you have to turn to MakeMKV alternative to do it. Q: Why DVD ripper crashes and doesn't show the correct length of the movie? A: Technically, this is a result of copy protections encoded on DVDs. Newly movies such as Manchester by the Sea, Hacksaw Ridge, Finding Dory, etc are typically placed with 98 fake titles and one correct. Common ISO converter cannot choose the right one and even show no valid source found error. So you have to turn to a powerful ISO Image to MKV ripper to bypass the protection schemes and rip protected DVD smoothly.